Ned Beindorf: They got my tools! Janet Beindorf: And the phone's gone too! Janet Beindorf: Oh my God! Ned Beindorf: Boarded up the windows? Grover: We boarded up the frames and filled the bases with cement. I used the cement that's been sitting in the garage for the past three years. 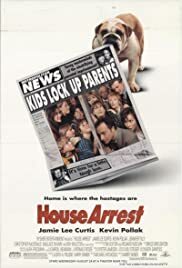 This comedy, about a teenager and his younger sister who lock their parents in the basement until they work out their marital problems, is not as bad as it sounds. We wind up with a bunch of kids upstairs who know how to relate to one another but gradually have to work out how to keep practical things running, and a bunch of adults downstairs who are just the opposite. In truth, neither side does very well, but at least this is not the tired condescension of the kids screwing up and needing to be rescued by the adults: both groups are portrayed with a mix of severity and sympathy. Throw in a meddling retired chief of police across the street, and make him Ray Walston whom I think everybody loved most in "Picket Fences," and you have a film that is very entertaining, and also carries across some deeper meaning about what contributions young people and older ones can make to each other's ongoing development. Kyle Howard was 18 trying to play 14, which took a good deal of suspension of disbelief, but that miscasting seems to be an obsession Hollywood just can't seem to grow out of.